JoeI've been fascinated by Istanbul, née Constantinople, née Byzantium, for years, so it seemed foolish to come all this way and not drop by to say, "Howdy!" Thus, my weekend in Istanbul. I've been doing my best to make it a weekend in Constantinople, actually—nothing against Istanbul or the Ottomans mind you, I just wanted to start with the place that was, and work my way up to the place that is, if you see what I mean. Not that it's really possible to make that kind of distinction here. 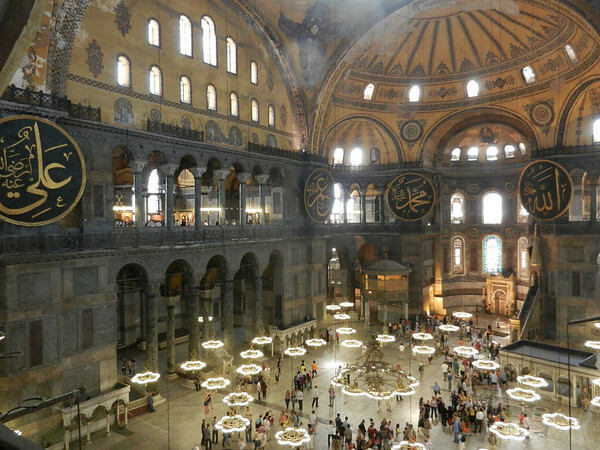 For example, I started this morning at Hagia Sophia, the cathedral built by Justinian in the sixth century, the largest cathedral in the world for the next thousand years, which after the Ottoman conquest became a mosque (and, after the declaration of the Turkish Republic, a museum). The result is an odd combination of Byzantine mosaics and Islamic calligraphy, that nevertheless works somehow. And, of course, the dome is truly impressive1. Anyway, I've hit a few of the Byzantine highlights, but Roman ruins and impressive churches are not the most striking thing about Istanbul. That honor must be reserved for the carpet sellers. There's a carpet shop around every corner in the old city; their ubiquity obviously presents a problem for erstwhile carpet salesmen trying to lure tourists into their shop. Hence, the carpet touts: a collection of eagerly helpful young Turks, each of whom just happens to have "friends" or "family" who just happen to run a small shop where they sell, oh, let's call them "authentic handicrafts." Now, I'm well aware that this isn't shocking — People taking advantage of tourists? Call the papers! — but what is hard to convey is just how omnipresent the carpet touts are in Istanbul. If you look like a tourist, you can expect to be approached by maybe one per block in the quieter parts of Sultanahmet, while on the streets around Hagia Sophia that number needs to be increased by a factor of four or five. Seriously, it is an incessant stream of "friendly" Turks asking if you have lost your way, pouncing if you hesitate at a corner for even a second, or (heaven forbid) you have the temerity to actually pull out a street map! Frankly, it's exhausting, and it makes the city extremely difficult to enjoy. Fortunately, there are no touts allowed in the archaeology museum, so I'm off for an afternoon with the worlds largest collection of Lycian sarcophagai. 1 Justinian hired a couple of mathematicians to design his church, neither of whom appears to have had any prior architectural experience. They took a look at the sources, did some calculations, and came up with a theoretically feasible design for the biggest dome in the world. Five years later, there it was, a miracle of engineering—that lasted for all of 20 years before it collapsed. It wasn't until after the conquest that the Ottoman architect Sinan finally managed to get the thing stabilized. As the (most likely insane) Jan L. A. van de Snepscheut (probably) said, "In theory, there's no difference between theory and practice. In practice, there is."